A life bookmarked with literary success got its just reward yesterday as Oliver Friggieri received a lifetime achievement award for his contribution to literature. The tribute scholar, writer and literary critic was the highlight of the 2012 National Book Awards, which also saw Clare Azzopardi scoop two awards and The Times Picture Annual 2011 place second in the non-fiction category. Edited by The Times photographer Darrin Zammit Lupi, the picture annual was pipped to the post by Andrew Borg’s Ilwien il-Festi Maltin Vol. 1. The winners were picked from over 120 submissions, with National Book Council executive director Joyce Grech praising authors for the high calibre of works submitted. Author Pierre Mejlak made away with the first prize in the Maltese Fiction category – the second time he has won the coveted award. His novel, Dak il-lejl inħallik tgħid, follows his 2010 winner Qed nistenniek nieżla max-xita. Ms Azzopardi scored a memorable double whammy, with her textbook 2MT and Maltese play L-interdett taħt is-sodda both winning first prize in their respective categories. Albert Marshall’s collection of poems Jumping Puddles won first prize in the Maltese poetry section. Charles Cini’s The Maritime History of Malta won the award for best biographical or historical research while the general research book of the year title went to Ġorġ Aquilina’s Il-Franġiskani Maltin 1482-1965. Veteran author Trevor Zahra was awarded the best children’s book trophy for his book Ħadd ma jista’ jkanta jew idoqq strumenti tal-banda and the best book for adolescents was Carmel Cauchi’s Kulħadd bl-istorja tiegħu. Prof. Friggieri’s lifetime achievement award was preceded by special prizes for Davida Flores’s illustration of Il-ħbieb tagħna, l-annimali and others for the production of Julia Farrugia’s Meta l-Mkunga twelled and Doris Micallef’s Paintings of Malta and Gozo. Joseph Debono won the best translation prize for his Dawl id-dinja. President Emeritus Eddie Fenech Adami praised Prof. Friggieri for his breadth of knowledge and work within academia. His literary contributions had brought Maltese literature international recognition, Dr Fenech Adami said. Culture Minister Mario de Marco reminisced about his late father, President Emeritus Guido de Marco, and his love of books. He praised local publishers and printers, who fuelled a €62 million-a-year industry, and said getting people to read in Maltese was still challenging. Prime Minister Lawrence Gonzi praised authors for following their passion despite writing not being their day job and said that Malta’s literary sector had come along in leaps and bounds over recent years. 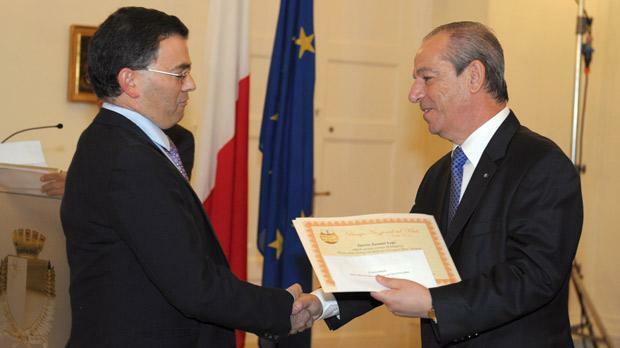 Former Prime Minister and Labour MP Alfred Sant won second place prize for his novel Bħal f’dizzjunarju and the runner-up award went to former Nationalist Party general secretary Joe Saliba’s book of Maltese poems Spiral.